Everyone is always searching for new friends and adding new friends in Facebook. The Facebook's friends list is constantly updated. One who is added new can delete you or unfriend you after some time. May be or may not be depending upon the relation between you and your friend. Unfriend finder or Who Deleted Me and many such sites help you to find out who has unfriend you from their friend list in Facebook. 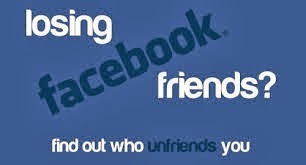 In my post, how to find who unfriended you in Facebook, I mentioned some sites where you can find out. But that you you don't get notified instantly. You have to check in those sites when you remember about this. There is an easiest way to get notified instantly. An extension Social Fixer in Firefox or Google Chrome displays the alert that someone just has unfriend you in Facebook. Note : If the add on or extension is not installed in your browser, then search it in Google and get it installed for your browser. When your Facebook account is on, and if any friend unfriend's you then directly at the right corner below of the screen you can get instant results displayed.